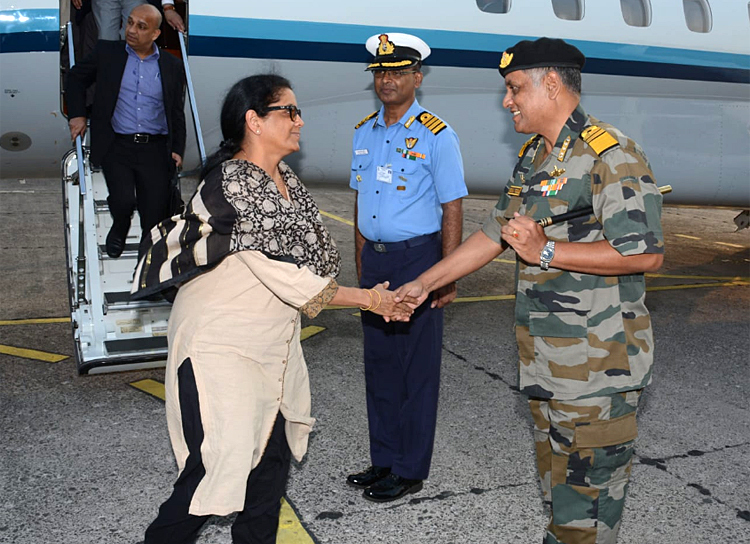 Defence Minister of India, Nirmala Sitharaman arrived at Port Blair on 13th evening and was received by Vice Admiral Bimal Verma, AVSM, ADC, Commander-in-Chief, Andaman & Nicobar Command at INS Utkrosh. The Defence Minister is on a two day visit to Andaman Nicobar Command (ANC) on January 13-14, 2019. On her second visit to the Command, she will be reviewing its operational preparedness and infrastructural developments of the outlying units of ANC. During her visit, the Defence Minister will witness an operational exercise involving all the forces of the Command, off Campbell Bay in the Great Nicobar Island on January 14, 2019. Nirmala Sitaraman will be interacting with troops and also inaugurating the second phase of Married Accommodation Project (MAP) consisting of 868 dwelling units for troops of ANC at Brichgunj Military Station.